In what must have been a belt-tightening measure, the production was consolidated to only one model, the Model “9”, in both Roadsters and Tourings. 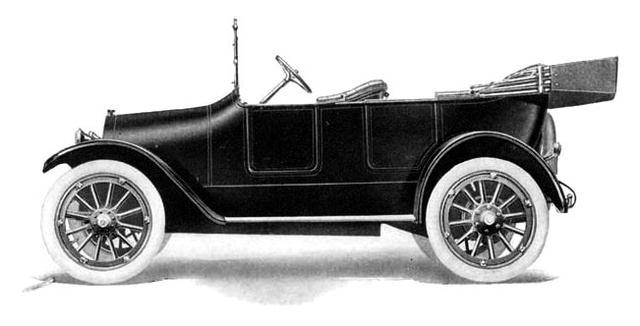 While Cartercar lasted longer than some other companies bought up in the first year of GM (1908-1909), it did not build any cars after May 22, 1915, although the corporation wasn't dissolved until later. The Model “9” chassis was very similar to the Model “7” chassis that preceded it, but the body was new and had a streamlined shape. It was offered with both touring and roadster bodies. 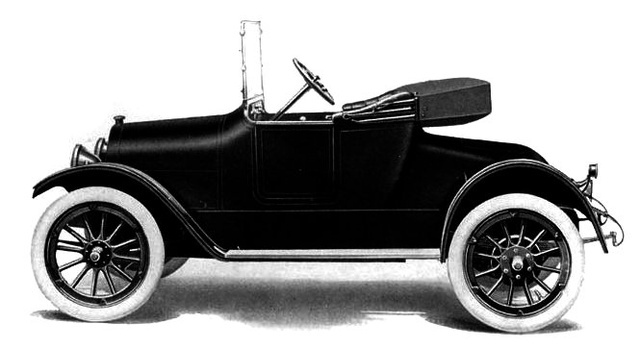 The model year started on August 1, 1914 and ended Saturday, May 22, 1915 when Cartercar production ended permanently. There were no 1916 models. Piston pin bearing, 7/8 by 1-7/8 inch. Connecting rod, lower bearing, 1-5/8 by 2-1/4 inches . Front crankshaft bearing, 1-5/8 by 3-7/32 inches. Center crankshaft bearing, 1-7/8 by 2-3/8 inches. Rear crankshaft bearing, 1-15/16 by 3-7-l6 inches. Front camshaft bearing, l-1/8 by 2 inches. Center camshaft bearing, 2-1/8 by 1 inch. Rear camshaft bearing, 1 by 1-3/4 inches. Standard Equipment Leather Upholstery, “rain vision ventilating windshield,” Delco Electric Starter, Electric Lights and Horn, Demountable Rims, Speedometer, License Tag Holders, Mohair Top, Extra Rim, Tools and Jack. Notes: Similar to the Model “7”, the Model “9” has many parts that come from other GM companies such as a Northway engine (model 52 or 54? ), Weston-Mott axle, Hyatt bearings and Jacox steering. Body - Completely new body with the addition of a driver's side door, sloping hood, cowl rounding gracefully to it, round top radiator, smooth-sided body, domed fenders with protecting edges fastened with concealed rivets, the elimination of side lights. Controls - New dash and electrical switches; the throw of the emergency and speed levers moved forward to accommodate the new driver's side door. This site is a work-in-progress to document Cartercar history and production. It will be improved as time and information permit. Copyright 2010-2019 cartercar.org - all rights reserved.